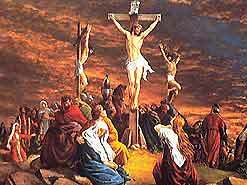 Why is the Crucifixion important to us? God knew we could not live the sinless life necessary for heaven. So He offered Himself in our place. He did that by becoming a man in the person of Jesus Christ, His own Son. Jesus lived a sinless life on earth. The Bible tells us "the punishment for sin is death". And since we all have sinned against God (Romans 3:23, 6:23), we needed someone who is sinless to die in our place. Jesus, being sinless, died in our place and became the saving grace of the world. He died for you and I. Romans 5:10 says, "For if, when we were God's enemies, we were reconciled to him through the death of his Son, how much more, having been reconciled, shall we be saved through his life!" The Bible says, "Believe in the Lord Jesus, and you will be saved. . ." (Acts 16:31). Attending church or performing good works will not contribute to your salvation. Our "good works" will bring us to hell because they are like filthy rags before Him. God saves you by His grace. Jesus is offering us the gift of eternal life. Will you accept it by faith? Glory to God.